Welcome, readers of the Edinburgh Evening News. You’ll likely be wanting to find something you can be abusive about. You’ll probably enjoy my recent article Video Protection on the Roads. 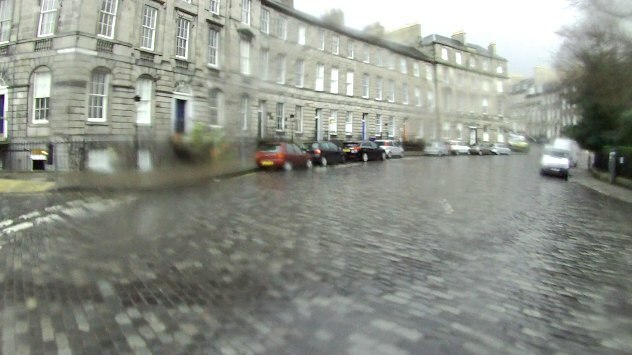 This is what it means to cycle in Edinburgh. I called this in using the 101 non-emergency police number, but while they did ask me for the registration number, they were seriously disinterested (they didn’t even ask for the time of the incident) and told me that regardless of video footage they would not proceed against the driver. This ended up forming the basis of quite a positive piece in the Edinburgh Evening News. There is some movement in terms of dialogue with local elements of Police Scotland. 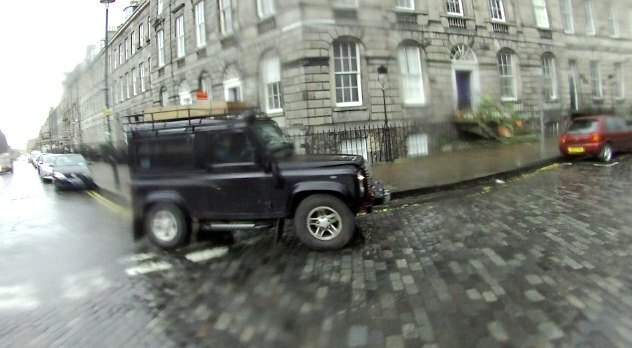 Shameful driving from that Landy, you are both on wet cobbles so greater care is called for and why does the driver have a mobile in hand? 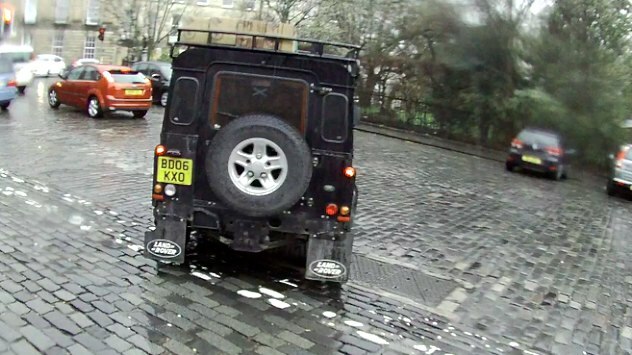 I hope you have put a written complaint into Police Scotland against the driver. Well done for not dragging him out of his vehicle and berating him forcefully. I’m truly sorry that you had such a horrible incident. The police do seem to be a bit over stretched in that they only get involved when someone is actually injured, and not always then. 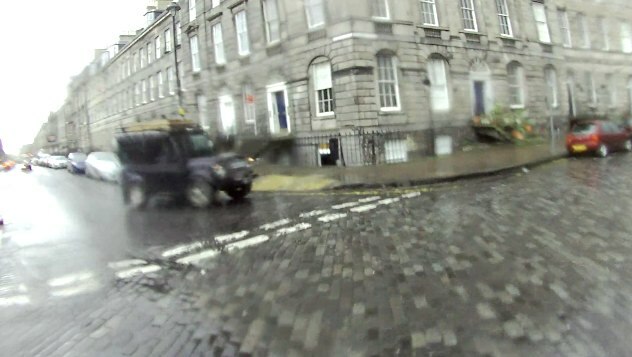 However, above all, thank heavens that cycling in Edinburgh is much more than this and even although incidents like this happen, there are also good days with no “incidents”. Thanks for posting this and keep your chin up! Good effort in getting the piece into the paper. I dont think I’d have confronted him like that, I’ve done things like that in the past, but on later reflection I’ve never been sure what I was hoping for other than venting. Opinion may differ, but the fact that the driver is texting on their phone even after a near miss is clear evidence to me that they are not at all contrite, whatever words they throw out while waving their mobile in the air (did they finish their text message around the next corner? No evidence to the contrary). He acknowledged he’d screwed up at the start. He was then faced with a confrontation, I wouldn’t have expected him to go all contrite at that. Folks usually dont like getting the point that they’ve screwed up laboured at them. I can see why you got so annoyed by this. 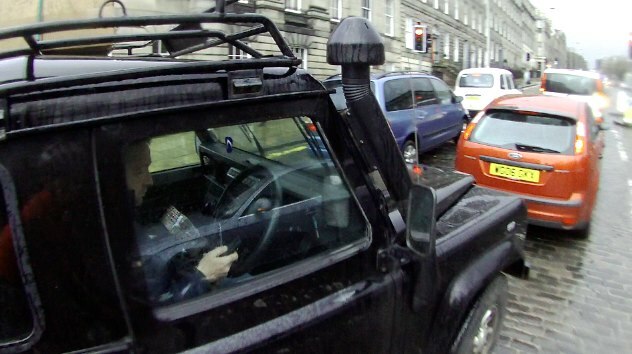 Use of phones is a widely ignored law, and I’ve read recently about how using satnavs when driving is perhaps worse of a distraction. 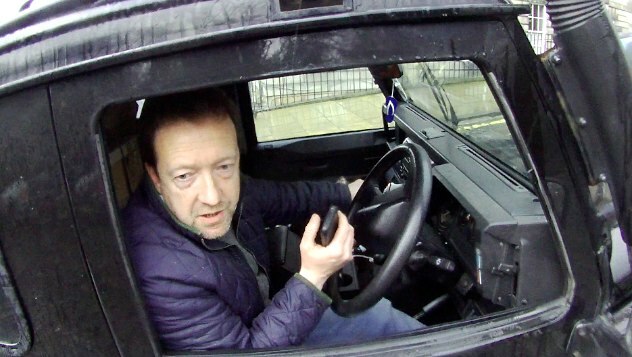 I cant see the phone law being extended to satnavs though. @steve – your anti-cycling prejudice is offensive. Maybe if you had learned to ride a bike as a youth you wouldn’t have such a chip. I appreciate you’re almost forty stone, but it’s never too late! Maybe you should finally get those swimming lessons too..
Wankers who have a problem with cyclists usually have some type of inadequacy much like homophobes and racists. thats a hilarious reply Swayze. Its so far off the mark that it makes me wonder if your serious. Just because I’m a cyclist doesnt mean that I have to agree with everything posted by Dave. The seagulls comment was a quote from his scotsman page, which was as small minded and funny as yours. And with attitudes like that, you can see why cycling remains a minority pursuit and people feel able to drive dangerously with impunity. It’s only if they actually take a life that they have anything to worry about (and often not even then. 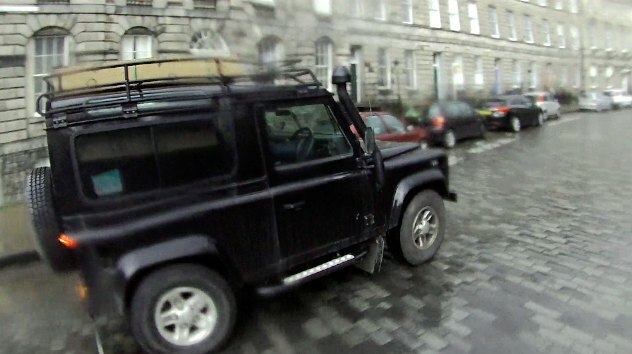 I’m not aware of any convictions following Edinburgh cyclist deaths except one outrageous incident of drink-driving).